Updated. The overall theme of iOS 5 (s aapl) is disconnecting your device from your computer. Photo Stream eliminates one big pain point I had with my iPhone: getting photos off of it. I’d take a funny picture with my iPhone and completely forget about it. I might show or send it to one or two people, but half the time, syncing photos was too much of a pain for me to bother. Now, with iCloud and Photo Stream, that hassle has been eliminated. Once I take a photo with my iPhone, as long as all my devices are connected to a Wi-Fi network, my photo will appear on all of them. My photos also appear on my Mac (in either Aperture or iPhoto, so long as they’re installed), or in the My Pictures folder on Windows(s msft). It’s one part of iCloud I can say worked exactly as advertised, but even so, it has both strengths and flaws. On a Mac: Go to the iCloud System Preferences pane and make sure Photo Stream is checked. 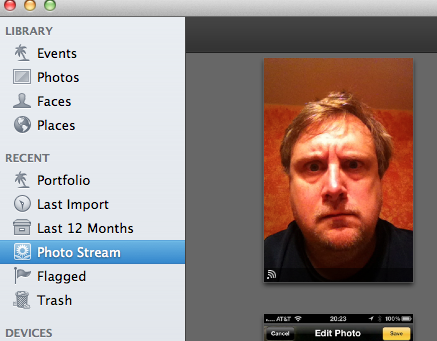 iPhoto: To enable Photo Stream in iPhoto, just go into the Preferences and make sure Photo Stream is checked. Once you’ve done that, click on Photo Stream in the sidebar and you’ll see your photos. Aperture: To enable Photo Stream in Aperture, just go into Preferences and make sure Photo Stream is checked. In this case, I’ve intentionally left Upload unchecked since I don’t want photos imported from my DSLR to go into the Photo Stream; just those I sync. Once that’s done, click on Photo Stream in the sidebar to see your synced photos. On a PC: First, download and install the iCloud Control Panel. Once you launch it — you guessed it — make sure Photo Stream is checked. You will also need to click on Options next to it to specify the Upload and Downloads directory. Photo Stream’s directive is simple: keep either the last 1,000 photos you’ve taken or the last 30 days worth, whichever comes first. Update: It’s only the last 1,000 photos you’ve taken on an iOS device, not on iCloud.com. But right now, it seems to require a chicken, two goats, and a shaman to get a photo deleted. None of my devices can delete directly from Photo Stream, and deleting the source image on the device where it originally appeared doesn’t delete it from Photo Stream. I’m perfectly fine with Photo Stream uploading my Camera Roll on a moment’s notice. What I’m not thrilled with is not being able to delete from Photo Stream. Part of my job description is taking iOS screenshots and during a heavy review week (like this week), I’ll take a ton of screenshots. I don’t need them or want them after they’ve been put in the article. Now, I’m kinda stuck with them. There’s been a lot of attention paid to this Photo Stream failing, so I expect Apple to issue a fix soon. You can reset your Photo Stream at icloud.com. This removes your photos from iCloud but keeps photos already on the device. For more information, see Photo Stream Help. Photo Stream photos can be removed from your device by turning Photo Stream off in iOS settings or in OS X Lion System Preferences. You can also delete any photos imported into your iPhoto or Aperture library on a Mac, or in the folder they’re imported to on a PC. Until then, be careful what you take pictures of if you plan to make Photo Stream a part of your digital life. I miss Mobile Me as well, particularly iDisk and iWeb. Photo stream is of no use to me. I want to have complete control over what photos I upload to iPhoto, edit, and only then distribute to other devices. It is annoying to have all those unedited photos sitting around. You have to be very careful of this feature. I turned on our Apple Tv last week and the screen saver photos were rather shocking. Guess my husband was a bit bored on his last business trip and was looking at some pretty interesting stuff online… Good thing I was alone – we had just had a kids birthday party at our house and used the Apple TV for music. Would have been slightly embarrassing! Rookie here. Just recently began using Apple products and I’m trying to get my photo’s from my PC to my ipad2. According to the FAQ, I can drag them into the Upload folder, which I have done, but nothing is in my iCloud. Help! Does anyone know if iPhoto has to be open for photo stream to work? Photostream also deletes the originals if you turn the thing off. It’s not worth the time and effort, particularly if you are near your computer. My Photostream isn’t working with ANY photos I’ve taken using the iPhone camera. If I take a screenshot or download some wallpaper using an app into my camera folder, then it syncs and I can see it in iPhoto. If I take a photo with the camera it simply doesn’t sync. Ever. At all. I’ve tried about 20 or 30 photos. The phone and macbook pro are connected to wi-fi (I’m at home), iPhoto is updated to 9.2 (iPhoto ’11), The OS is 10.7.2, the phone has been updated to iOS 5 and everything else works in iCloud: Calendar, Find my mac/iphone, Contacts, mail etc. It’s driving me crazy and I’ve been at least a day searching the web and trawling through forums but no answer. I can’t go to an Apple store because I’m living ans working in China at the moment and it’s an 8 hour round trip to Beijing on the plane (or 58 hours on the bus). If anyone has any advice please help. Here’s a question I’m not seeing answered anywhere (perhaps you know the answer?). When I take a video with my iPhone and it is in my camera roll, of course it doesn’t sync with my PhotoStream (it IS a “photo” stream, after all. Plus the file size would become an issue.) and I don’t assume it would. But I am also on a Wi-Fi sync set up with my computer. Before I would be able to copy them over when I have my iPhone plugged in through iPhoto, but I don’t see any way to import videos from my iPhone camera roll to my Mac. Am I missing something obvious? How do I wi-fi sync my camera roll videos? Or … am I still stuck to a wire? I’ve been wondering the same thing. I’m beginning to lean towards a wireless importing app like PhotoSync, but was hoping for a more integrated solution. I am currently using Mobile Me to allow my clients to view and download specific images from my DSLR for a particular project, typically up to 100 images. What I now understand is that this feature is no longer available as of June 2012 and I am stuck with iCloud’s inability to allow friends and clients from seeing my images. I hope I have this wrong because it seems like we’re going backwards and iCloud replacing Mobile Me prevents me from sharing high quality images/videos. Your “gotcha” isn’t the REAL gotcha. No, the REAL gotcha is any family with multiple Apple IDs and devices trying to use the same iPhoto to combine all of their photos with Photostream. It’s impossible – one Apple ID, one Photostream, period. I can’t see any way around this. Unbelievably un-Apple-like. Actually, this whole iOS 5/iCloud migration/etc. has been incredibly clunky, very Microsoft-like. Confusing even for someone who’s been following all of this all along. Ive been trying to get photo stream working on my iPad 2 and it just won’t. Works great on my phone and pc. Any ideas? All settings are te same as my phone. What am I doing wrong? When I open my iPhoto prefs, there is no photo stream icon or option. I have updated to Lion 10.7.2, so why do I not have a photo stream icon? 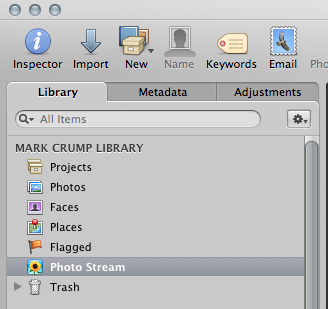 Photo Stream still has a lot of quirks to be used seriously in a photographer’s workflow. 1. The options on Windows iCloud control panel allows you to choose an Upload and Download folder, however it does not allow selection of a NAS drive, even if it is mapped to a drive letter in Windows. With thousands of photos/videos, it would make sense to allow Photostream to import directly to a NAS drive. 2. Photos and videos imported on an iPad 2 via the Camera Connection Kit go into an “All Imported” album. Using the new Edit features in iOS 5, the modified photos are saved, but the modifications did not appear in PhotoStream, nor did it actually provide any option to save to the Camera Roll. So the workflow using a Camera Connection Kit with PhotoStream is not clear, especially if I would need to connect a cable to sync back the edited pictures from my iPad back to the iPhone and PC. It would have been better to allow any photo upload from the iPad/iPhone instead of just the pictures clicked on that device. iCloud on Windows allows this, although that is not free of problems either (see next). 3. iCloud on Windows provides an Upload folder to put photos on the photostream that were not taken on a given iOS device. Pictures copied to that folder it did come to my PhotoStream, however, they also remained in the Upload folder as well. I could not delete them either as ApplePhotoStream.exe seems to have them locked, so now I have three copies of the photos (original, upload folder, photostream folder). Not a clean design approach. As it stands, Photo Stream works for very basic photo sync of the original clicked photos with no editing, but apart from that the workflow is not well optimized. I have iPhoto, my iPhone and my wife’s iPad. Both have seperate apple id’s. Can iPhoto import photos from both photo streams? Mark, despite Photo Streams initial quirks, Photo Stream is Apple’s Trojan Horse to “change everything” when it comes to pictures. Jobs admitted Apple failed with Mobile Me Gallery. I just don’t get that. How was Gallery ever a failure? If I could pay $100 a year just to keep gallery live, I would! It just works. ANd it is simple and classy- all the competition that I will have to use from now on to share photos really pale in comparison, as they are buys, have ads, and they try to sell you stuff. I know a lot of people like me who are really depressed about loosing the best thing about MobileMe. Besides iDisk. Don’t get me started. I agree 100%. MobileMe Gallery Rocks, I have been using it since day 1, and challenge anyone to find a better or cleaner interface. It just steams me that I can no longer upload my new iPhone 4s awesome 8 megapixel pictures, and 1080p videos directly to the Gallery. I too would pay 99 per year just to have Gallery back! I wrote my comments to apple on their iCloud feedback section, I suggest all that miss Gallery, iDisk or iWeb do the same. If they don’t hear you, it will be lost for good, and it is a top notch product, just majorly UNDER-ADVERTIZED. Though, that wipes everything out. Yeah. I don’t want to nuke from orbit. why complicate it so much? You can reset your PhotoStream. Granted, it doesn’t remove any of the photos that have already been pushed to your devices. But there is a way to clean out PhotoStream.